A few years back I had the opportunity to interview psychologist and mediator Dr. Barry Goldstein for an article I was writing about co-parenting after divorce. I never finished that piece (my sincere apologies, Barry), but over the course of the conversation, he spoke about the definition and purpose of anger in a way I'd never heard before, and which has stuck with me ever since. Through the MeToo Movement's organic rise, my own deeply painful custody proceedings, and the confirmation debacle hearings revolving around Donald Trump's Supreme Court nominee Brett Kavanaugh and the allegations and testimony of Dr. Christine Blasey Ford, Dr. Goldstein's explanation of righteous vs. toxic anger has rung more meaningful to me with every passing day — particularly in regard to the mounting commentary on and fear of angry women. 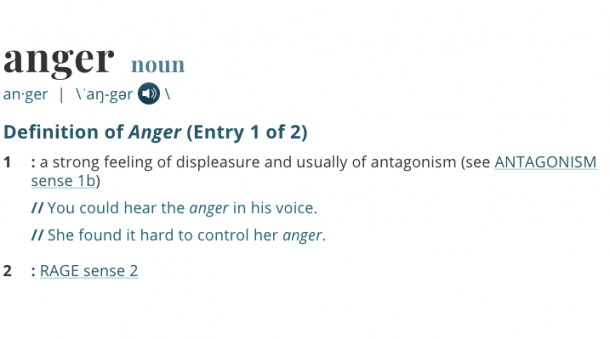 What is anger, what causes it, and where does it come from? The dictionary definition of anger is "a strong feeling of displeasure and usually of antagonism." "You could hear the anger in his voice. She found it hard to control her anger." We tend to think of anger as a negative emotion, because it is one we don't like feeling within ourselves or directed toward us. So when we discuss it, we typically do so in terms of looking at how to control anger "issues" and rage, especially when the person feeling this emotion is an angry, angry woman. However, emotions in and of themselves are neither positive or negative. They simply are what they are, which is the way we feel at given point in time under a particular set of circumstances. What Dr. Goldstein told me (and I paraphrase) is that the purpose of anger as an emotion is to drive us toward making meaningful changes in our lives. When something in our life is unhealthy for us or detracts from our well-being, we feel angry about it. Feeling angry doesn't feel good, so we attempt to change the circumstance to the extent we are able to in order to feel "positive" emotions instead, such as happiness and satisfaction. Under these circumstances, anger can be considered "righteous." Anger becomes toxic, Goldstein continued, when we remain stuck in that emotion even though it no longer serves a positive purpose. This distinction, to me, is huge, and it's been a helpful tool I've kept in my mental back pocket to pull out when I need to check in with myself because I feel particularly upset about something. Under the best circumstances, I'm able to make a conscious effort to stop and ask myself if there is a purpose this anger could serve. If the answer is yes, I try figuring out what that purpose is and how I can best address it. If the answer is no, I try to breathe slowly and let the anger go so I can move on. Of course, circumstances aren't always the best, and when my anger becomes overwhelming, I, like most women I know, also begin feeling guilty, sad and ashamed. Feeling angry is "bad" ... right? At least, it seems that way as far as women are concerned. As President Donald Trump said just yesterday, "It is a very scary time for young men in America." As I've watched the Kavanaugh circus tents implode in front of the US Senate Judiciary Committee, on the news, and in ferocious debates across social media, I found myself arriving at a new connection among the dots Dr. Goldstein had laid out. If the innate purpose anger serves for human beings as a species is motivating them to initiate change, it's no wonder so many men — and so so many women — are terrified of women's anger. An angry woman is a woman who wants things to change. And she feels driven to be the catalyst of change if no one else will. An angry woman is not going to sit back and let anyone take control of her power or her rights ... at least, not unless you can shift her from anger to that place full of emotions like shame, guilt and fear — that place you believe she rightfully belongs — before she gets in the way of "how it's always been." "[Her] impact, like her voice, spread in all directions. She prompted a searching national conversation about sexual harassment that was desperately needed and that had consequences that benefited tens or hundreds of millions of women in this country and will benefit the generations to come as they enter the workplace. She made an adjustment in the unequal distribution of power — not so grand an adjustment that the problem was remedied, but a shift that matters." Anita Hill's anger, and the anger of those who heard her, saw themselves in her, believed her and understood her, was righteous. It led to significant change that has benefited our society as a whole. Change is understandably scary, but there is a reason it is an unavoidable fact of daily life for every living creature on this planet. Instead of asking yourself, "Why am I so angry all the time?" try asking yourself, "What is my anger about, and how can I harness it to achieve positive change in my life or in the world?" And instead of asking, "Why are women so angry?" consider what cause they may have to be so, just like you already assume is the case when you yourself feel enraged. The world will change no matter what. It's an inevitable fact of our existence. I, for one, would prefer to have a say in how it does rather than sit silently afraid of accepting that truth. Isn't that really what the "American way" is all about? Senior Editor and former mediator Arianna Jeret, MA/MSW, is a recognized expert on love, relationships and divorce who has been featured in Cosmopolitan, The Huffington Post, Yahoo Style, MSN, Fox News, Bustle, Parents and more. Find her on Twitter and Instagram for more.